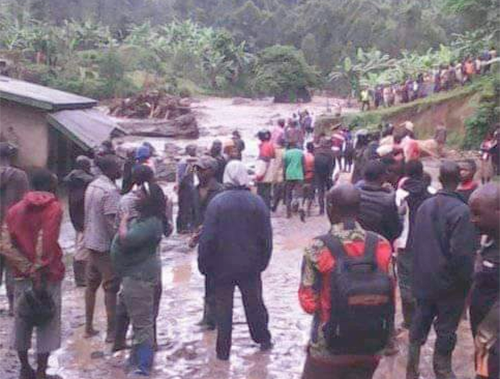 Among the dead include primary school pupils and over 500 people were left with no homes.The deaths came after more than five hours of heavy raining in Bukalasi Sub-county, Bududa district. A repeat of the 2012 disaster that led to death of hundreds of Ugandans in Bududa resurrected on Thursday evening when heavy mudslides hit the area again leading to death of twenty people with more yet to be confirmed. Homes and schools with Suume Junior Academy pupils in particular and residents were dumped into River Suume that feeds River Manafwa. Police later joined to retrieve residents in the river and those whose homes were still covered by the rains. “When the rains subsided, we found out the many houses along the river had been washed away and many people missing. The river got flooded and it came rolling with trees, heavy stones, washing away houses and people,” Mr John Namutambo a resident narrated. However, the Elgon region police spokesperson Manshur Sowedi said the number of those dead could still go above twenty as the search continues. Bukalasi Sub-County chairperson Mr Peter Kisolo said that many of the people were left homeless by the heavy rains that struck the area. Some of those who survived were rushed to Bukalasi health centre III after sustaining broken limbs. Several disasters have been happening for example in 2011, a mudslide in Bulambuli killed about 28 people, six people in Sironko District in march 2012 and in June 2012, buried 18 people in Bududa District and the recent one being 10 people buried in Sironko district. Kabwegyere tells Bududa landslide victims to eat monkeys in place of food. David Wakikona calls for more attention to Bududa landslide threat.